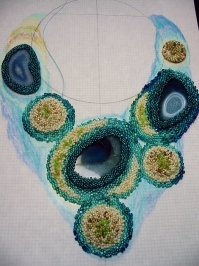 Here's a little update on the Atolls necklace. I'm more and more convinced that it would have been much, much easier to do this in bead embroidery. Connecting these shapes, without making bridges and leaving empty spots, is driving me nuts. Doesn't matter if you don't like it... I like it a lot! Hahaha, ok Annette, I like your point of view! Thank you so much for your kind and fun comment!